Kilmartin is a small village some thirty miles south of Oban on the west coast of Scotland. A succession of churches has occupied the site set high above the wide and flat Kilmartin Glen to the south. One is recorded as being built or rebuilt at the end of the 17C. 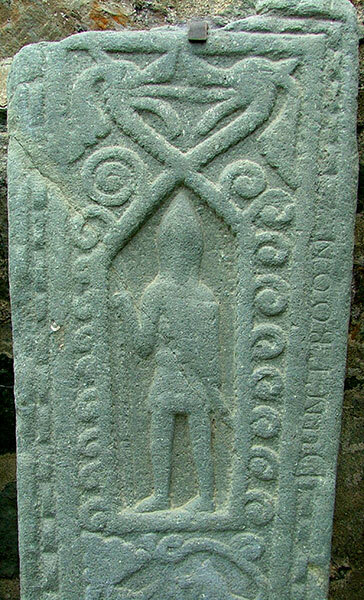 The inscription above the date on this stone lying in the churchyard reads as 'KILMARTIN Ch. Built'. The current building in Gothic style was completed in 1835: its crow stepped gables are a distinctive feature. 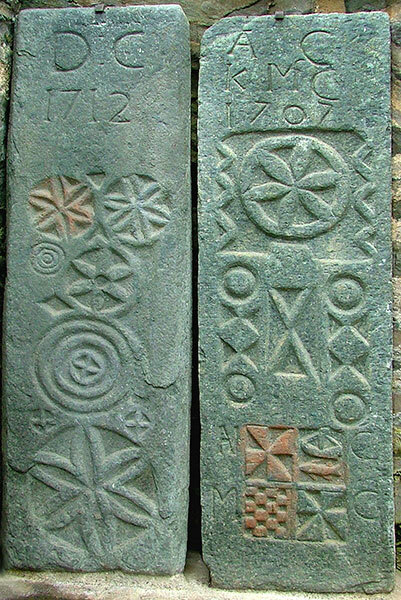 This is a detail from a nearby stone structure dated 1627 built as a burial aisle to enclose the tomb of Neil Campbell, a Rector of Kilmartin and Bishop of the Isles. Open to the weather until relatively recently, it has been roofed in glass to shelter and illuminate twenty-three carved grave slabs displayed against its walls. Originally these would have been laid on the ground to indicate a family grave site. 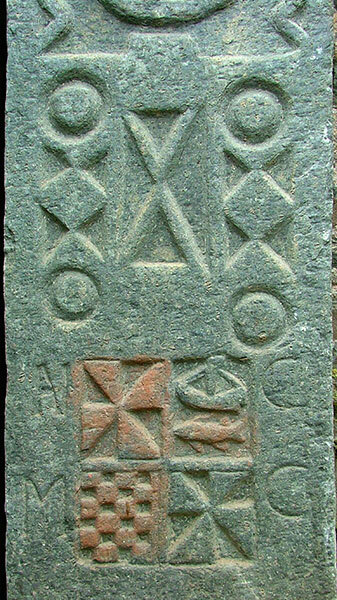 The name cut into the border is a later addition to this stone, perhaps to recycle it to record a later deceased. 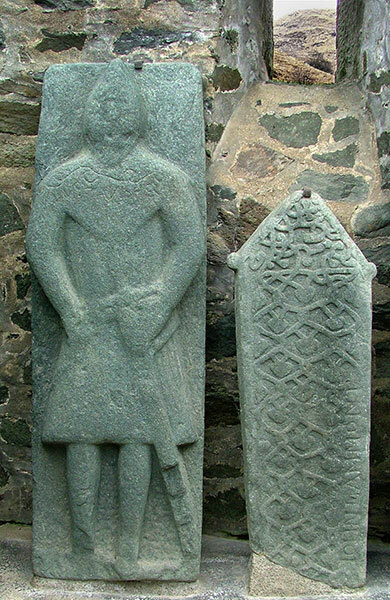 A knight's sword and Celtic abstractions feature on many of the other slabs. The slabs are arranged in date order from the left of the doorway as one enters. These two dated stones conclude the display to the right of the doorway. A geometric detail from one of the pair recorded in the previous image. 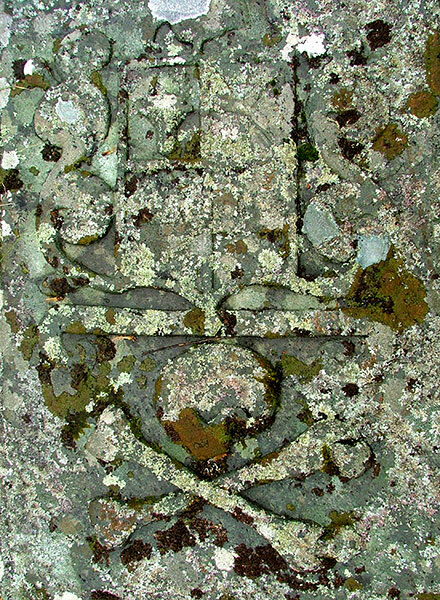 In the open churchyard lichen cloaks the detailing of this heraldic shield set above a skull and crossed bones. 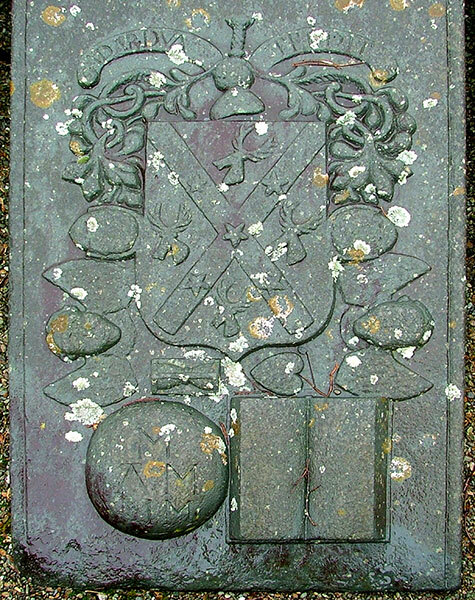 The family crest is set in the lower portion of this grave slab carved to record the demise of the Rev. Archibald Malcolm in 1685, and his wife Christiane. A dedication in Latin is inscribed at its top. 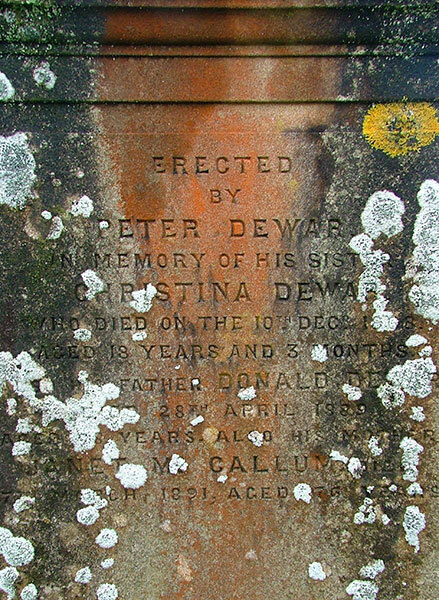 Rain enhanced the colours of this and six other slabs of earlier dates set within the stone kerbed Poltalloch Enclosure in the graveyard. 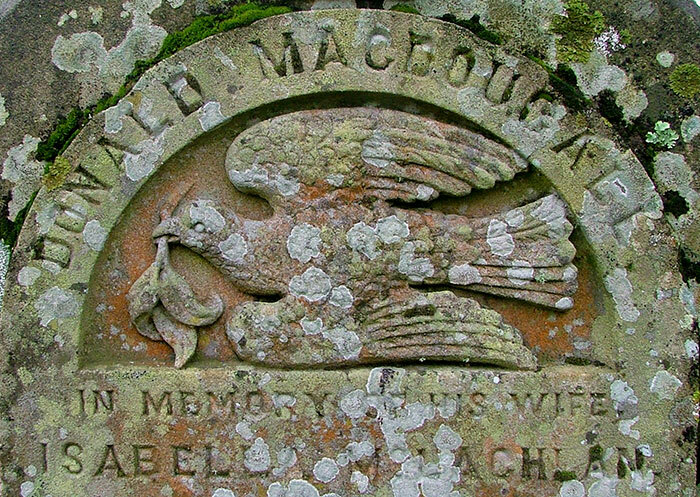 All seven once marked the graves of the Malcolm family who owned hereditary estates a little to the south-west at Poltalloch. 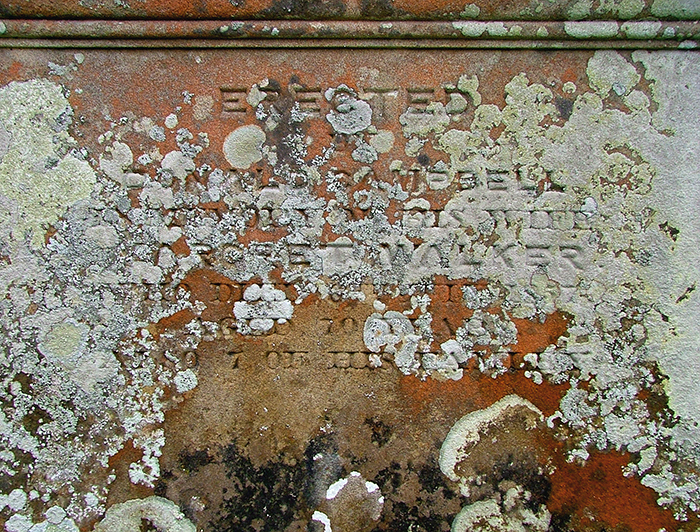 The estate name is incised into the six earlier stones. 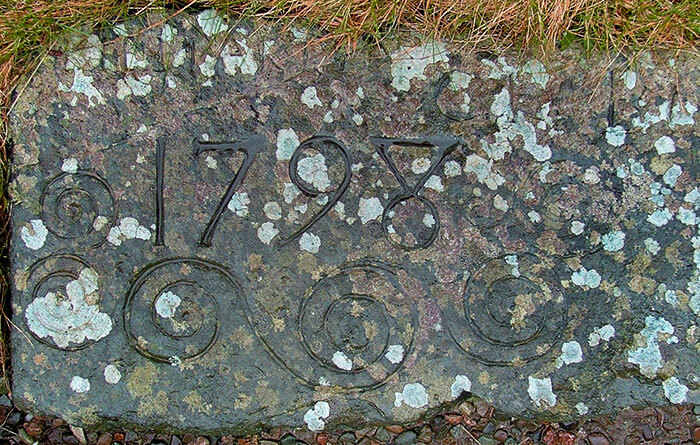 Historic Scotland suggests that the family were adapting earlier stones for their own members. 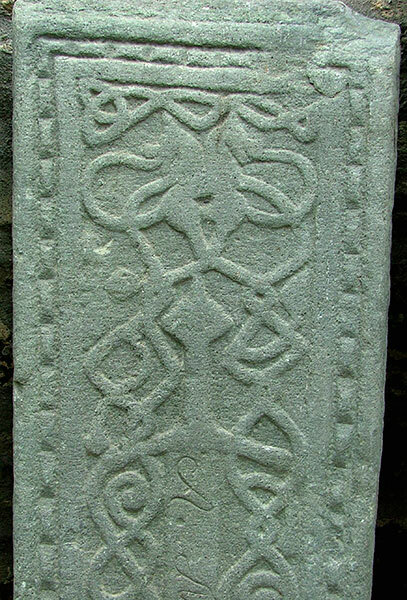 A modern plaque states that 'These grave slabs from the Poltalloch Estate are products of a group of sculptors working around Loch Awe in the late 14th and 15th centuries.'. Two more of the Poltalloch stones glisten. 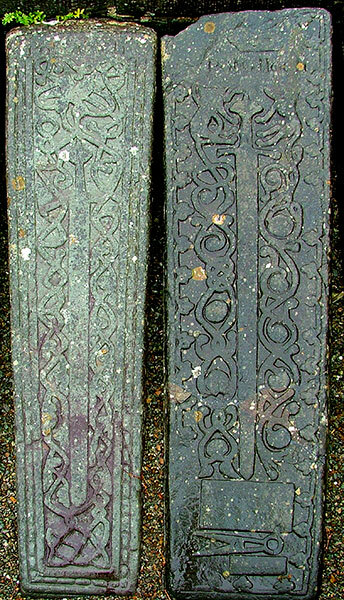 Other grave slabs can be seen grounded elsewhere in the churchyard. In 1853 a Poltalloch House was completed for the Campbell family; it now stands in ruinous decay after abandonment and roof removal in 1957. Mid-March and there is little sign of Spring in the trees by the churchyard. 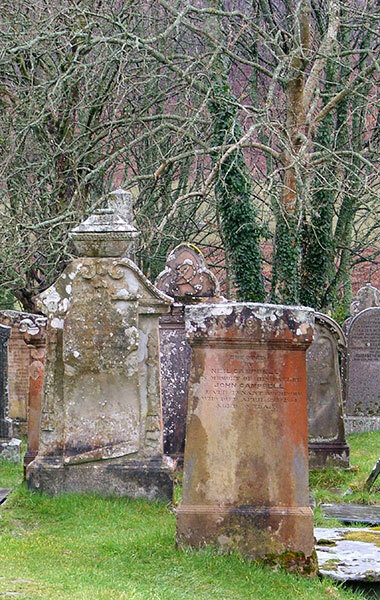 The gravestones are varied in style and stone. 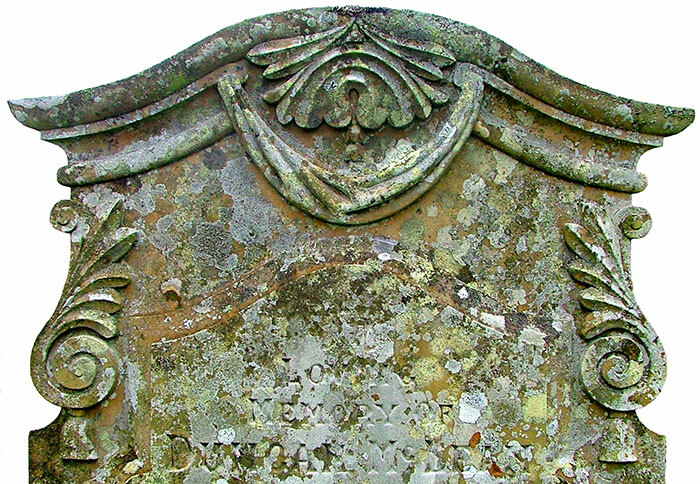 Many were enriched by lichen patterning and their colours enhanced by rain. The painterly abstraction on the foremost stone appealed. 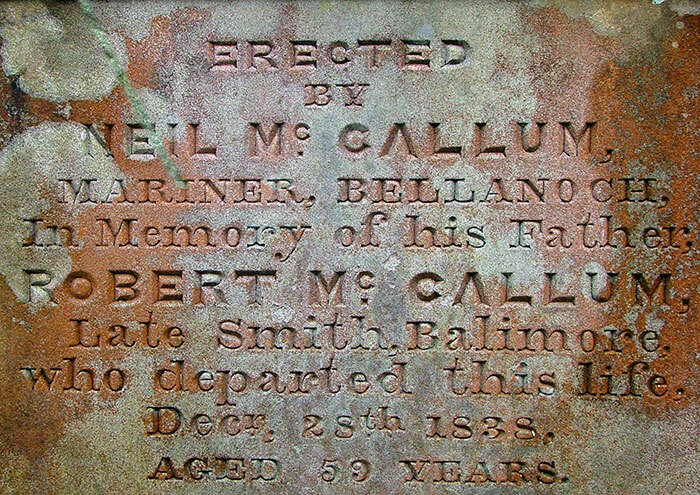 The elegantly simple letter cutting on this McCallum Family grave marker is still sharp after a century and a half. A smith's hammer, horseshoe and calliper symbolise Robert McCallum's profession. I was particularly drawn to this simple style of sandstone marker, strongly weather stained and colonised by lichen. 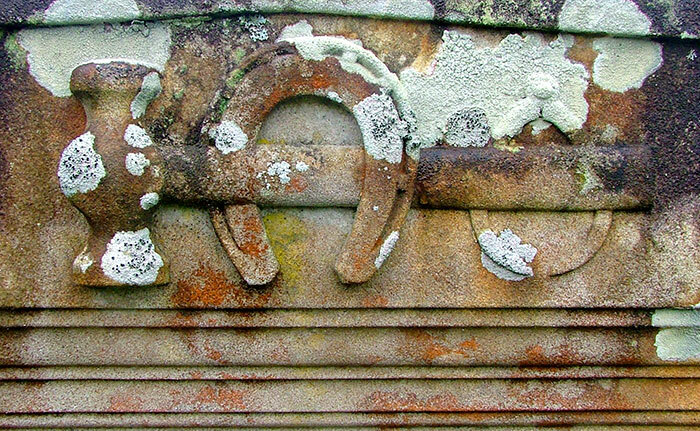 Graveyards everywhere host some of the most beautiful examples of design and craftsmanship in stone and Kilmartin is no exception. Some places I've visited have had memorials removed from graves and placed against walls, laid flat as pavements or simply destroyed, perhaps to enable efficient grass mowing to keep everything tidy. Their loss also takes away ancestral records that apart from names and dates can include other details of the deceased as in Image 13. Kilmartin Glen to the south carries one of the largest collections of prehistoric sites in Scotland. Standing stones, burial cairns, forts, cup and rings marked stones are easily accessible on foot. Beyond lies The Great Moss, the remains of a lake that once covered the Glen. It's now a flat expanse of fields, woodland, water pools, fresh and saltwater marsh and mudflats, all home to a wide variety of plants and wildlife. Moine Mhor National Nature Reserve occupies some 1,200 acres.